Randy Ableman is in his 20th season as the head coach of the Miami diving team. Since joining the Hurricane coaching staff in 1989, Ableman has developed the Hurricane diving team into one of the nation's premier programs, while making his mark as one of the nation's most respected diving authorities. Ableman is a nine-time NCAA Diving Coach of the Year, earning the national honor six consecutive years from 1995-2000 and was named the BIG EAST Men's Diving Coach of the Year in 2000, 2002 and 2003 and Women's Coach of the Year four consecutive times from 2000-2003. In 2002, Ableman was honored by U.S. Diving as he was awarded the Phil Boggs Award, presented annually to honor those who have achieved individual excellence in diving and have given back a part of themselves to assure the sport's continuation and success. Ableman is an eight-time NCAA Coach of the Year In 17 seasons at Miami, Ableman has coached 10 National Champions to a NCAA-record 21 individual national titles, including four-time NCAA Champions Dean Panaro, Rio Ramirez and Tyce Routson. From 1991-2002, in one of the most impressive streaks in NCAA diving history, the Miami men's and women's diving teams combined for 20 individual NCAA Championships. During which time, the Hurricanes won at least one national title for 12 consecutive seasons, naming at least two NCAA Champions in six seasons. Miami swept the field at the 1997 Men's NCAA Championship, winning the 1-meter springboard, 3-meter springboard and 10-meter platform and in 1996 the Hurricanes placed first, second and third in both the 3-meter springboard and 10-meter platform. Ableman led the Hurricanes to another NCAA record in 1996 with the trio of Tyce Routson, Brian Gillooly and Chris Mantilla becoming the first freshman in NCAA history to sweep the 10-meter platform at the NCAA Championships. Under Ableman's guidance, 22 Hurricanes have garnered All-America honors with at least one UM diver earning All-America stats every year since 1989. In 1995, the Hurricanes became the first school in NCAA history to have five divers - Jose Gil, Brian Ramos, Chris Mantilla, Brian Gillooly and Tyce Routson - earn All-America honors in the same year. Hurricane divers have also excelled on the Olympic level during Ableman's tenure, with a total of nine divers, representing six different countries, competing at the Olympic Games since 1992, including U.S. Diving Team member and former Hurricane Kyle Prandi and current diver, Jenna Dreyer of South Africa who competed at the 2004 games in Athens. In 2004, Ableman made his third trip to the Olympic Games as a member of the U.S. Olympic Diving Team coaching staff. He also served on the 1996 and 2000 Olympic teams and in the summer of 2003, Ableman served as the U.S. Pan Am Games head coach. 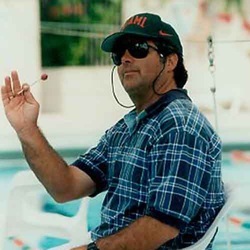 Ableman came to Miami in 1989 after a five-year stint as the head diving coach at the University of South Carolina from 1985-1989 and a one-year stay as the head coach at Wright State in 1984. A native of Cedar Rapids, Iowa, Ableman graduated from the University of Iowa with a bachelor of science in recreation and education in 1983. A four-time All-American while at Iowa, Ableman was the 1981 NCAA Champion in the 1-meter springboard and holds the Hawkeye school record in the 3-meter springboard. Ableman was inducted into the University of Iowa Athletics Hall of Fame in 2005. In 1980, Ableman was named to the U.S. Olympic Diving Team, but was forced to miss the 1980-Moscow games due to an American boycott. From 1978-1984, he was a member of the U.S. National Team. He is married to the former Karen Gorham, who was the 1980 U.S. Indoor champion in the 1-meter springboard. The couple has one daughter, Charlotte Patricia.